The first six weeks of school might well turn out to be the most challenging for your student. They’ll be adapting to the academic and social rigors of college while also learning to manage their own time and make good choices. You can play a role in helping your student through those first weeks of school. Follow these tips to assist your student and keep them on track as they begin their college career. Schedule a time to talk on the phone once a week. It allows your student time to meet new friends, study and get involved, while providing you the time to check-in and stay connected. Texting is also an easy way to keep in touch. Ask if they are using a planner or calendar for time management. Their new found freedom can be hard to adjust to without some structure. Remind your student to eat, sleep and exercise on a regular schedule. Good holistic health helps improve academic performance. Inquire if your student is attending class and studying. We recommend they study at least 2-3 hours per class per week. Support them through their academic adjustment. Most college level courses require a large amount of work done outside of class. It may take several hours and days to complete and probably cannot be completed right before class. They should review their syllabus often to check for important dates and deadlines. If they have questions, stop by the professors office hours to get more information. Talk about their new friends. Continue to affirm family expectations around their social life, personal safety and responsibility. Talk directly about your expectations related to drinking and drugs. Find out if they are getting involved. Suggest they join a major specific club or social student organization, play intramural sports or get an on-campus job. These activities help with future networking and provide overall positive sense of belonging to UWM. Discuss budgeting and have them visit the Financial Aid Office. Students can track their expenses using online budget tools like Mint.com to better understand how finances may affect their newfound freedom. Refer your student to the UWM resources available when they hit their first obstacle. If they’re not sure who to ask, their Resident Assistant (RA) or the Student Success Center is a great place to start. 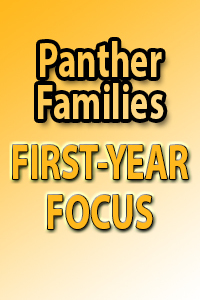 Join the Panther Family Facebook Page and Panther Family Facebook Group to receive updates and tips a few times per week.